PROVO, UT--(Marketwired - June 15, 2015) - After nearly two decades of both educating and entertaining a worldwide audience with his New York Times bestselling books and monthly column, Kerrying On, author Kerry Patterson today released a new book, The Gray Fedora: Lessons on Life, Business, and Everything In Between (VitalSmarts Press; Hardcover; June 15, 2015; $19.99). Comprised of forty of his readers' favorite stories from Kerry's personal experiences, The Gray Fedora includes Kerry being nearly dragged from a moving car, blown to pieces, burned up, and eaten by sharks. But he somehow manages to escape in order to share stories about these fascinating places, wonderful people, and the lessons they teach us. "My life's work has culminated in books like Crucial Conversations that rely on social science and decades of consulting experience -- so, as you can imagine, it was a bit of a departure to essentially write a bathroom book," joked Kerry. "Each story runs four pages so the book fits nicely into a 'one-story-per-sitting' environment. The hope was to make it accessible to all readers -- no matter their age or background. In essence, what I try to provide in The Gray Fedora are insightful, touching, and often humorous stories from the life of a baby boomer who stumbles his way through equally confusing childhood, teenage, and adult years -- en route to a looming dotage." 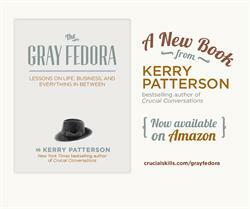 Available today: The Gray Fedora, by Kerry Patterson.